Medieval lords may have been tyrants to their underlings, but at least they left some great architecture behind. A turbulent history, rich atmosphere and scenic beauty await you at one of Latvia’ best preserved castles. A trip along the Liepaja highway reveals different modes of living. The road passes farmhouses with loads of character to makes up for the lack of indoor plumbing. The occasional Soviet-era apartment blocks sprout up like bad acne. On the outskirts of the village of Jaunpils are several newly-built residential houses, as lacking in personality as suburban McMansions in the West, proof that either someone has figured out how to make money in the Latvian countryside, or Riga’s commuter belt now stretches 85 km to the southwest. And then you have Jaunpils – literally “New Castle” – itself. With a cannon, a pond (if not exactly a moat), a resident ghost and walls sturdy enough to lock away the most delectable damsel, it is everything that a castle should be. But this is not Disney – it is a battered but real monument to the forces that have shaped Latvia’s history. Feudalism came to Latvia in the early 13th century with the arrival of German soldiers and priests, and the construction of Jaunpils dates from 1301. Its characteristic tower went up around 1400 to give added protection against improved artillery, but the place really came into its own in 1545 when the von der Recke family became lords of the castle and numerous villages in a 13 square mile area. For almost four and a half centuries, surviving wars, famines, family disputes and near bankruptcy, they were powerbrokers in Latvia’s Western region of Kurzeme, and as the sands of European diplomacy shifted they fought in turn for the rulers of Poland, Prussia and Russia. They were reputed to be harsh toward their vassals – disobedient peasants were forced to stand on broken glass in the niches on either side of the main gate – but there were some gentler personalities too. Eliza von der Recke, wife of one of the lords, lived at Jaunpils from 1771 to 1776, and was an energetic traveler and writer who corresponded with Goethe, Kant and Beethoven. 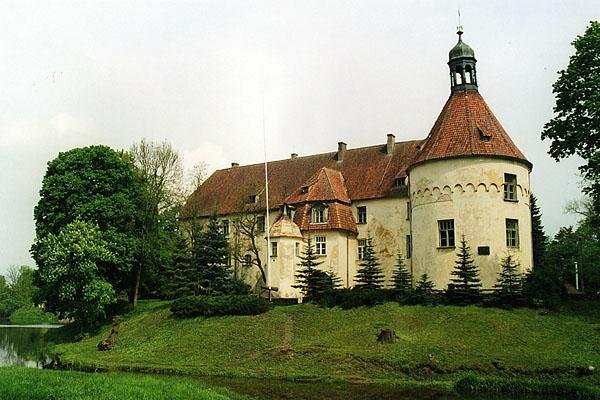 She reportedly disliked the castle itself but appreciated the surrounding countryside, and took an active interest in the culture of the Latvian peasants. And the 19th century Lord Christopher Emil Gedert von der Recke made many improvements to his estates and built schools, earning the affection of the people. But their gratitude was short-lived apparently, since the castle was burned to the ground by rebellious peasants during the 1905 revolution. The dynasty was finally evicted from Jaunpils in 1919 as punishment for the last lord Wilhelm von der Recke, who had supported renegade German soldiers against the Latvian forces in the war of independence. Fortunately for posterity, the exterior was rebuilt true to the original between 1907 and 1914. So besides looking like it did for hundreds of years, we have evidence of the eccentricities of some of its residents. For example, on the northern side there is a down-pipe in the shape of the devil. Apparently during rain it used to sound like someone was vomiting, a tasteful feature installed by one of the lords to stop his brother from drinking. There also used to be a secret passageway to the nearby church, which dates from 1592. It has a stately 75 meter high tower and beautiful 16th century alter, and the niches out the front were used as pillories for minor criminals – the locals must have been an unruly lot. The nearby 200-year-old watermill is also pretty and shows that someone must have been doing work and not just getting into trouble. The interior fared worse. During both the first republic of Latvia and the Soviet occupation the castle housed a cattle breeding institute, and restorations finally undertaken in the 1960s destroyed all the original character. But there are some interesting older items. In the upper hall is a beautiful statuette of a Madonna and child by an unknown 16th century Italian artist. One version of how it got there is that it may have been a gift from a Napoleonic delegation on its way to meet the Czar in St. Petersburg. And the fireplace room, formerly the library, has some portraits of the von der Reckes, including the enlightened Eliza. Even if worn parquet and Soviet stained glass don’t give an ancient feel, the halls are still very popular as a wedding venue, and performers in old-time costumes can be hired to make things more authentic. And for a hands-on experience, the cozy pub in the courtyard can arrange medieval feasts without cutlery. Whether you’re into gnawing pork knuckles or just enjoying the stillness of a beautiful place, Jaunpils will leave you with plenty of memories.